People have conspiracy theories on just about anything. When what is presented as fact doesn't add up to scrutiny how is that a conspiracy? There is a limit to how far the naked eye can see. Also take into consideration humidity, terrain, air pollution and we are restricted. Its a simple principle, if you were to apply your thinking and look to the heavens then we should see everything without a telescope but you know that is not the case. How does water stick to the sides of a round object? Gravity? The same gravity that a mere insect can defy? If the earth were a spinning ball then all the oceans water would be located at the equator instead of being distributed evenly around the supposed globe. When I first looked into this subject I thought it was silly but all the evidence leads me to believe we are being deceived. If the earth slowly formed while it was spinning then it should be a disk at the very least or not exist at all. Since when does matter coalesce around a spinning object, it actually gets thrown away from it. When your on a plane do you notice it dropping 2640 feet for every half mile of travel to stay within the confines of the atmosphere? Of course not. According to ball earth theory the earth drops 8 inches per mile squared yet cities, mountains and tall buildings are seen in its entirety when they are supposed to be miles below the curvature of earth. top 10 ways to know the Earth is unequivocally, absolutely, positively, 100% not flat! Aristotle (who made quite a lot of observations about the spherical nature of the Earth) noticed that during lunar eclipses (when the Earth’s orbit places it directly between the Sun and the Moon, creating a shadow in the process), the shadow on the Moon’s surface is round. This shadow is the Earth’s, and it’s a great clue on the spherical shape of the Earth. Since the earth is rotating (see the “Foucault Pendulum” experiment for a definite proof, if you are doubtful), the consistent oval-shadow it produces in each and every lunar eclipse proves that the earth is not only round but spherical – absolutely, utterly, beyond a shadow of a doubt not flat. If you’ve been next to a port lately, or just strolled down a beach and stared off vacantly into the horizon, you might have, perhaps, noticed a very interesting phenomenon: approaching ships do not just “appear” out of the horizon (like they should have if the world was flat), but rather emerge from beneath the sea. But – you say – ships do not submerge and rise up again as they approach our view (except in “Pirates of the Caribbean”, but we are hereby assuming that was a fictitious movie). The reason ships appear as if they “emerge from the waves” is because the world is not flat: it’s round. Planes can travel in a relatively straight line a very long time and not fall off any edges. They can also circle the Earth without stopping. The Earth is different from other planets, that much is true. After all, we have life, and we haven’t found any other planets with life (yet). However, there are certain characteristics all planets have, and it will be quite logical to assume that if all planets behave a certain way, or show certain characteristics – specifically if those planets are in different places or were created under different circumstances – our planet is the same. In 1610, Galileo Galilei observed the moons of Jupiter rotating around it. He described them as small planets orbiting a larger planet – a description (and observation) that was very difficult for the church to accept as it challenged a geocentric model where everything was supposed to revolve around the Earth. This observation also showed that the planets (Jupiter, Neptune, and later Venus was observed too) are all spherical, and all orbit the sun. A flat planet (ours or any other planet) would be such an incredible observation that it would pretty much go against everything we know about how planets form and behave. It would not only change everything we know about planet formation, but also about star formation (as our sun would have to behave quite differently to accustom a “flat earth” theory), what we know of speeds and movements in space (like planets' orbits, and the effects of gravity, etc). In short, we don’t just suspect that our planet is spherical. We know it. The time in New York is 12:00pm. The sun is in the middle of the sky (though it’s hard to see with the current cloud coverage). In Beijing, it’s 12:00am, midnight, and the sun is nowhere to be found. In Adelaide, Australia, it is 1:30am. More than 13 hours ahead. There, the sunset is long gone – so much so, that it’s soon going to rise up again in the beginning of a new day.We have time zones because when the Sun is illuminating one side of the spherical Earth, the other side is dark. This can only be explained if the world is round, and rotating around its own axis. At a certain point when the sun is shining on one part of the Earth, the opposite side is dark, and vise versa. That allows for time differences and timezones, specifically ones that are larger than 12 hours. Another point concerning timezones, the sun and flat/spherical Earth: If the sun was a “spotlight” (very directionally located so that light only shines on a specific location) and the world was flat, we would have seen the sun even if it didn’t shine on top of us, the same way you can see the light coming out of a spotlight on a stage in the theater, even though you – the crowd – are in the dark. The only way to create two distinctly separate timezones, where there is complete darkness in one while there’s light in the other, is if the world is spherical. Consider a sphere. Since a sphere has a consistent shape, no matter where on it you stand, you have exactly the same amount of sphere under you. (Imagine an ant walking around on a crystal ball. From the insect's point of view, the only indication of movement would be the fact the ant is moving its feet. The shape of the surface would not change at all.) A sphere's center of mass is in the center of the sphere, which means gravity will pull anything on the surface toward the center of the sphere (straight down) no matter where it's located. A plane's center of mass is in the middle—which means that gravity should pull objects toward the center of the plane.I am quite positive that, even for Australians, an apple falls downwards, not sideways. But if you have your doubts, I urge you to try dropping something – just make sure it’s nothing that can break or hurt you. In the past 60 years of space exploration, we’ve launched satellites, probes, and people to space. Some of them got back, some of them still float through the solar system (and almost beyond it) and transmit amazing images over to our receivers on Earth. 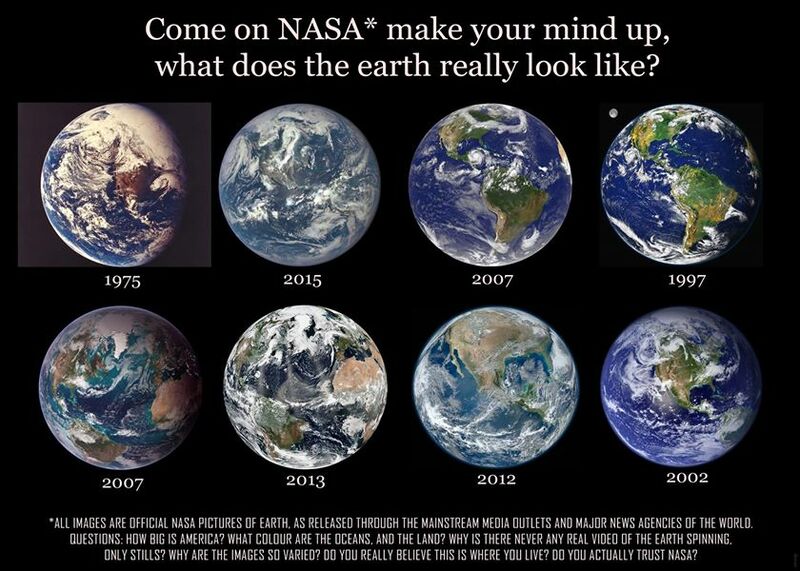 And in all of the photos, the Earth is (wait for it) spherical. The curvature of the Earth is also visible in the many, many, many,many photos snapped by astronauts on the International Space Station. The difference between me and you is that I will read your copy and paste rebuttal but you will not watch my video let alone answer any of the questions I posted. I will respond but I would like my questions answered as well. I cant respond to every one of your rebuttals but get serious man and respond to mine. I have done my homework, don't just believe everything that is told to you. Ships and the Horizon – I have seen plenty of videos and real life situations where a ship supposedly looks like its sinking into the ocean due to perspective and then brought back into full view by zooming in. This would be impossible on a ball earth as the curvature would prohibit the ship from being seen no matter how far you zoomed in. If you have ever seen a long hallway the floor and ceiling sink into each other and become indistinguishable. Sea level is known as such because it is LEVEL. Water does not curve anywhere in real life, it always seeks its lowest level. Enormous lakes in Russia freeze solid and they are known to be the longest and flattest areas on earth, there is no bulge or curve from the frozen water. Curved water has never been observed ANYWHERE. You cant step back for a minute and think it through logically? How does water stick to a ball? How does a rotating ball for that matter have water sticking to all sides when in reality and the science lab the water is drawn towards the equator of something that spins and then is ejected AWAY from it? Ever heard of the Bedford Level Experiment? If Earth were a ball 25,000 miles in circumference as NASA and modern astronomy claim, spherical trigonometry dictates the surface of all standing water must curve downward an easily measurable 8 inches per mile multiplied by the square of the distance. This means along a 6 mile channel of standing water, the Earth would dip 6 feet on either end from the central peak. Every time such experiments have been conducted, however, standing water has proven to be perfectly level. The natural physics of water is to find and maintain its level. If Earth were a giant spinning sphere tilting and hurling through space then truly flat, consistently level surfaces would not exist here. There would be a massive bulge of water in the oceans because of the curvature of the earth. If earth was curved and spinning the oceans of water would be flowing down to level and covering land. Some rivers would be impossibly flowing uphill. There would massive water chaos and flooding! What we would see and experience would be vastly different! But since Earth is in fact an extended flat plane, this fundamental physical property of fluids finding and remaining level is consistent with experience and common sense. The water remains flat because the earth is flat! The experiment known as “Airy’s Failure” proved that the stars move relative to a stationary Earth and not the other way around. By first filling a telescope with water to slow down the speed of light inside, then calculating the tilt necessary to get the starlight directly down the tube, Airy failed to prove the heliocentric theory since the starlight was already coming in the correct angle with no change necessary, and instead proved the geocentric model correct. Of course you can see farther from higher! If the earth were a ball you would see the earth falling away from you 360 degrees in all directions and it would be more noticeable the higher up you are in the sky but reality is that the horizon is flat no matter how low or high you really are. The rebuttal given is absolutely horrible and proves nothing. Everyone’s favorite astrophysicist Neil Degras Tyson even states that you cannot see the curvature of the earth from a plane because you’re not high enough! No plane ever fly’s with its nose pointing downwards as is goes around the supposed ball earth. Gyroscopes on planes provide 100% proof that the earth is not a ball. Ask any pilot if they make corrections for curvature and they will say NEVER. Use flight tracker and notice how all southern hemisphere flights disappear from radar only to reappear right before they land. This doesn’t occur in the northern hemisphere. Southern international flights always show up in the northern hemisphere before going back down to the southern hemisphere. Why? Isn’t a straight line the fastest route? So because all the cue balls on a pool table are of spherical shape that must mean the table is a sphere as well? There are several OFFICIAL images of earth from NASA over the years with the continents different sizes, different colors, etc. Every picture of the planets are CGI renderings and never real. More than half the time it shows the satellite orbiting a planet but who is taking a picture of the satellite? I have downloaded images from NASA myself of pictures taken of earth from the moon and messed with them in photoshop to reveal a cut and paste job of the ball earth stuck in the photograph. We know our government lies but we blindly trust NASA? I have seen bubbles in space, astronauts arms disappearing in front of the green screen (CGI FAKERY). Half of the science videos from hubble don’t even make sense and are not even scientific! Guys are bouncing around in gorilla costumes, have easter eggs, pumkins and decorations for every holiday? Really? What crap. So basically the thinking is because I saw it in a picture it must be real. So wait, I just read this and did not watch the video. Forget ships and the horizon...if the earth is flat, how can a ship leave NYC, sail around the world and return to NYC? For example, a ship leaves NYC and travels south around the tip of South America, heads west into the Pacific and Indian Oceans. After rounding the horn of Africa, it would turn north into the Atlantic and travel back to NYC. The flat earth theory would make this impossible, yet it happens regularly. Any idea how that happens? Don't even bother. This is a nonsense thread. I am fascinated that in 2016 that someone still believes the earth is flat and conspiracy theories in general. Agreed. It's not worth wasting time and energy. Anyway, none of my world-travelling friends have, you know, fallen off the face of the earth. Da boom tiss. Your all a bunch of lazy sheeple who wont do research. Its hard to come to grip that what you have been taught is a lie. Stay ignorant just like they want you yo be. If you did research you would understand that even though its flat there is no edge. My friends are Naval Officers and on a clear day can see 15 nautical miles, they use laser to track ships out to 28 nautical miles (ships that are supposedly thousands of feet below the curve and they see them). Lasers do not bend with the curve of the earth. They use high powered binoculars to track ships miles and miles away - even at night (so dont give me the image is being reflected nonsense). You believe the earth is round because NASA told you? They cant even make up there mind how big the continents are in there FAKE photos. Coriolis effect is complete BS: A person can shoot and gun and has to take the spinning earth into account when performing long ranges shots because the bullet leaves the surface of the earth YET a plane doesn't have to worry about landing on a moving runway? You guys are so intellectually lazy to do research to see that things don't add up. Water on all sides of a BALL? Impossible, and cannot be replicated ANYWHERE except your imaginations. Sailing to the East or West the deflection of a needle of the compass is such that a vessel will merely sail in a circle about this center pole. The United Nations knows the earth is flat. While I admire your enthusiasm, frankly, who cares if the earth is flat, round, hexagonal or a trapezoid. My TV works, I have internet, planes fly, cars drive and the sun shines (sometimes). Point is, people have opinions, some people think the earth is round, others dont. Some people believe in God (I do), some dont. Whatever makes you happy is great, be happy. Why try to change others? It's called gravity. If the United Nations thinks the earth is flat, they should definitely be kicked out of New York. What do ants have to do with anything regarding gravity? I can lift up heavy objects and so can a crane, that has nothing to do with gravity. Its just weight or mass, gravity has never been proven but everyone tosses this word around as the solution for everything. Again the earth is spinning at 1000 MPH and magical gravity holds the oceans in place. Again, water never has a curved surface and when something spins it draws the water to the CENTER of the spinning object, all the water is concentrated in one area YET the only place you see water covering a spinning ball is on FAKE pictures from NASA who themselves admit they have no ONE shot of earth from a distance, everything is a composite image. You need to research more instead of spitting out what you were told which doesn't hold up under real scrutiny.